No, thatâ€™s not the issue number of a rare comic Iâ€™m searching for. Itâ€™s a phrase that has brought me no small amount of scorn and ridicule from my wife over the years. As the New York Comic-Con looms next week (one which I’ll be driving to with my buddy Jim Amash), let me hearken back to another convention trip years ago that really sticks in my mind. It was 1979, and the Atlanta Fantasy Fair was days away. I was then 17, and after much begging and pleading, Iâ€™d convinced my parents to let me make the three-hour drive from Montgomery, Alabama with my best friend Matt Turner. Matt and I had saved our money for months in anticipation, but we were looking for some last-minute subsidies. Learning that glass Coke bottles could be redeemed for the princely sum of 10Â¢ each in Atlanta (you only got a nickel in my hometown), we combed our relativesâ€™ garages and attics searching for six-packs of transparent green treasure. We managed to accumulate 100 bottles, adding a cool ten bucks to our budget. We left my house early Saturday morning in my beat-up 1971 Datsun 510 station wagon to the sound of glass bottles clinking together in the back seat of my car. My car (if you want to call it that) burned through oil like a bank through T.A.R.P. money, and at our first hourly stop to add a quart, the oil cap slipped out of my hand, landed on one of the dry-rotted hoses in the engine, and caused a trickle of water to leak out of the hose (or, at least, we hoped it was water). No way were we gonna turn around and head home from this minor mishap, after all it took to convince my dad to let us go solo. A quick search of the car found an old roll of electrical tape, and we made a makeshift patch from an old rag, and taped it tightly around the hose. We filled up some of the Coke bottles with water, and lumbered on down I-85, stopping every time the temperature gauge started heading toward “H”, and added water to the radiator. We reached Atlanta an hour before the convention opened, and proceeded to cash in our Coke bottles at a grocery store. They would only accept half of them, so we decided weâ€™d cash in the rest on Sunday, rather than miss the opening of the con. In an attempt to save even more cash to spend on comics, we purchased a loaf of bread and two packs of the cheapest pressed chicken luncheon meat we could find. You know the kind; sliced thinner than comic book newsprint, and loaded with little hard things that we passed off as â€œprotein.â€ But we computed that if we only used two slices of meat per sandwich, weâ€™d have enough to last the weekend. And we didnâ€™t dare splurge on a jar of mayonnaise – that 89Â¢ could be put toward comics! We checked into our hotel (paying up front to avoid spending the money on comics), turned the Air Conditioner on high, and set the lunch meat on the vents to keep it cool. After putting our remaining Coke bottles in the room for safe-keeping, we loaded up on dry chicken sandwiches and ice water, and headed for the con. The first day of the convention, we found more things to buy than our budget would allow. By dayâ€™s end, weâ€™d depleted our funds, leaving only $5 gas money for the return trip. But I still needed copies of Nick Fury, Agent Of S.H.I.E.L.D. #3 and #5 for Jim Steranko to sign. Knowing we had more yummy dry sandwiches to sustain us the weekend, and five dollars worth of Coke bottles to use for gas money, I dropped my last â€˜fiverâ€™ on #3, and got Sterankoâ€™s signature on a treasured collectible. Little did we know what horror awaited us back at the hotel. When we walked in our room, my first thought was to make sure the lunch meat hadnâ€™t gone bad. A quick sniff told me it was okay, so I prepared our dinner. But suddenly, Matt screamed. The maid who cleaned that day apparently thought they were trash (although Matt and I swore she was out somewhere living it up on our five bucks). Regardless, we were stranded in a hotel room in a strange city, with no money for gas, and only a few dry sandwiches to eat. We were terrified! What would we do?! I didnâ€™t have a dime to call home, and anyway, my father would kill me when he found out Iâ€™d carelessly spent all my cash! Desperate thoughts started to sink in. Could I sell my comics back to the dealers? Could I sell the car? Could I sell Matt?! After a restless night, I still had no ideas the next morning. And suddenly, I remembered My Emergency 10. You see, when I first got my driverâ€™s license, my father had stashed a folded-up ten dollar bill behind the photos in my wallet. â€œThis is Your Emergency 10, son. Forget itâ€™s there, and only use it in an emergency,â€ he said. And every so often, heâ€™d pull a surprise inspection of my wallet to make sure I still had it. Iâ€™d quickly learned to completely forget about it, lest I succumb to the temptation to spend it. I reached into my wallet, and there it was! Ten semolians!! The look of relief on Mattâ€™s face was overwhelming, and as we sat there eating our dry chicken sandwich breakfast, I contemplated what to do with the extra $5. My first thought was to go buy that Nick Fury #5 and get Steranko to sign it, but I decided to hang on to it, in case another emergency came up. …and we threw caution to the wind and used that five bucks to buy lunch at McDonaldâ€™s! Because after two days of consuming those awful chicken sandwiches, no emergency would be worse than having to eat them again! Luckily, no other misfortunes befell us that trip, and I managed to replace my Emergency 10 before my dad pulled another surprise inspection. But to this day, I still keep a ten dollar bill tucked away in my wallet for emergencies. My wife laughs at the idea that $10 will make a difference today in an emergency. But it has saved me (and her) many a trip to the ATM machine when we were short on cash for a quick lunch. And I always replace it immediately. Thereâ€™s just something very reassuring about knowing itâ€™s there. This entry was posted in TNT on 29 January 2009 by Mr. Morrow. Diamond Comic Distributors has just announced some big changes in how they deal with publishers, which probably won’t have any effect on Marvel and DC, but the smaller guys like us are eyeing the new policies very closely. The one that’s generating all the hubbub lately is their decision to raise their order minimum (ie. the bottom line amount of orders after their discount) to $2500 per item. Basically, any order for less than that amount will not be sent to us in most cases, although I’m hopeful they’ll make some exceptions for longstanding publishers (like, um, us). It doesn’t really affect new issues of our mags (or any of our books, since those have higher cover prices), except for BrickJournal, which sells most of its copies outside of comic shops (although the comic shop sales are a nice benefit, and losing those will hurt, and they are on the upswing in comics shops). But it will affect our ability to do “Offered Again” itemsâ€”resoliciting something to alert people who might’ve missed a book the first time it was listed in PREVIEWS. Naturally, the second time something’s listed, it gets fewer orders than the first time, and frankly, we do rely on O/As to generate some much needed income on our lower selling books. Without it, any number of worthy, but really niche items that we want to publish, probably won’t be able to be published. But just as disturbing to me is Diamond’s new policy, stating that once a MAGAZINE is listed in PREVIEWS, they won’t accept reorders after 60 days of the item’s release. (And I hope I’m reading that right; if it’s from the scheduled ship date, that cuts the 60 days down even more if we ship something a week or more later than planned.) So 60 days after its release, Diamond will basically erase the item from its system, as if it never existed, and even if it’s a runaway best seller, comic shops won’t be able to reorder it after that point. And of course, since Diamond wouldn’t want to get stuck with extra copies of something after that 60 days, I’m sure they’ll be cutting their initial orders on magazines. In the last couple of years, Diamondâ€™s been cutting initial orders on magazines, but weâ€™ve been making most of it up on reorders within the first couple of months of release, although some would trickle in beyond a two-month window. I guess that trickle is officially dead now. Weâ€™ve been hearing from retailers for years that they canâ€™t get magazine reorders from Diamond, only books. (We even put a notice to that effect in our January 2008 catalog, so people would stop trying to place reorders for mags through their local comics shop, then end up waiting months and nothing would ever show up. A few people viewed that as an anti-retailer stance by us, but it was just our way of helping our customers AND retailers avoid the frustration of never getting their reorders.) At least Diamondâ€™s made it official now, so weâ€™re all clear on the rules. Iâ€™m not as concerned about losing a few reorders, as I am about the long-term effect thisâ€™ll have, on us, on retailers, and the industry. Plain and simple, our old stuff sells. Unlike Wizard and other mags, our stuff isnâ€™t dated. Itâ€™s either about comics history, an artist spotlight, or a how-to publication, none of which relies on the latest comics crossover event, or Hollywood blockbuster, to make it marketable. If someone with an interest in comics history shows up in a comic book store (or flips open PREVIEWS) and has never seen ALTER EGO or BACK ISSUE! before, it wonâ€™t matter whether they see the newest issue, or one from three years ago; both are just as likely to appeal to them. Which is why weâ€™ve always had a thriving audience for our older issues, and we try to keep them in stock. Itâ€™s impossible to grow magazine readership these days through comics shops, with Diamond putting disincentives like minimums and reorder windows in place, and so many retailers only willing to order enough copies to fill their pull list, and not stocking a single extra issue for a new reader to discover. So weâ€™ve got to keep pushing people to our website and our convention booths to buy them directly from us. Weâ€™ve made a push over the last two years to get more retailers to order directly from us (we offer discounts comparable to Diamond, and free shipping), and there are a few of the larger or more service-oriented retailers whoâ€™ll take the time and effort to do so, to keep their customers happy, and coming back to their stores regularly. To my mind, those are the ones most likely to weather the current economic storm, and stick around for the long term. And weâ€™re about to sign up with Haven Distribution so retailers will hopefully have a more convenient route to reorder our mags; maybe Haven can come up with the right formula to be successful stocking the lower-priced items. I understand what Diamondâ€™s doing; cutting costs like everyone else the last couple of years. It costs a lot to warehouse tons of paper, and theyâ€™ve consolidated down to just 3-4 warehouses now, from the 7-8 they used to operate 4-5 years ago. In that 4-5 years, an awful lot of new paper has been printed, so do the math; if youâ€™ve got 4-5 more years of additional printed material in the system, and 3-4 fewer warehouses to hold it, either thereâ€™s a black hole somewhere sucking up all that stuff, or Diamondâ€™s just not stocking it all anymore. The logical choice is to stop warehousing lower-priced stuff, like comics and magazines, and save the warehouse space for big ticket books, which bring more profit. To do that, theyâ€™re moving into the retailer mentality of only ordering whatâ€™s preordered, so they donâ€™t get stuck warehousing a lot of lower priced material. Thatâ€™s a great short-term practice to cut costs, but a lousy long-term policy for growing (or even sustaining) your business. Or at least, that’s my $.02. Your mileage may vary. Anyway, the moral here is, be sure to pre-order our stuff (especially magazines) at your local comics shop, or from our website, or there’s no guarantee you’ll always get it. (But use your local comics shop if you have one; we want to keep all the remaining ones in business.) And our books should still be readily available through Diamond. But particularly for magazines, don’t expect your local comics shop to be able to get our older issues for you, unless they’re willing to order directly from us. This entry was posted in TNT on 26 January 2009 by Mr. Morrow. On the show this month, host Chris Marshall goes it alone and delivers the news on a Signed, Limited Hardcover edition of George Khouryâ€™s The Extraordinary Works of Alan Moore – Indispensable Edition. The book is expected in mid-January. Also, Chris announces The Comic Book Podcast Companion by Eric Houston. TwoMorrows offers you the chance to go behind the scenes of ten of today’s top comic book podcasts. Slated for May 2009, this book not only gets you caught up with your favorite personalities, their history and techniques, but it also is a helpful guide on how you can become a podcaster, too! Lastly, Chris also goes over all of the January 2009 releases and tells you how to get the Free 2009 TwoMorrows Catalog Update. This entry was posted in Tune-In and tagged books, magazines, podcast on 6 January 2009 by Mr. Marshall. And thanks for all your support of our publications in 2008! This entry was posted in TNT on 6 January 2009 by Mr. Morrow. A new year, and a new TwoMorrows Catalog Update! 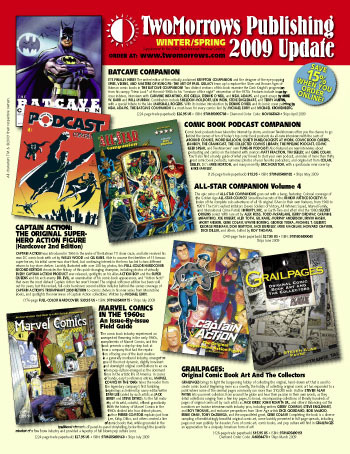 It’s 6 pages (so not too huge of a download; only about 2.5 mb), and lists all the new items we’ve got planned through mid-Summer, plus updated info on items that weren’t in our 2008 Catalog (which is also still available for download, so you can see all our available back issues and books). And I’ll be happy to mail you a free printed copy of either the new 2009 Catalog Update, or the 2008 Catalog, OR BOTH! Just add them to your shopping cart and checkout, and they’ll be whizzing their way to you asap.